There are 31 Assisted Living Facilities in the Independence area, with 6 in Independence and 25 nearby. To help you with your search, browse the 71 reviews below for assisted living facilities in Independence. On average, consumers rate assisted living in Independence 3.3 out of 5 stars. Better rated regions include Raytown with an average rating of 4.0 out of 5 stars. Caring.com has helped thousands of families find high-quality senior care. To speak with one of our Family Advisors about assisted living options and costs in Independence, call (855) 863-8283. Independence, Missouri is well-known for being the longtime home of Harry Truman, the 33rd president of the United States. 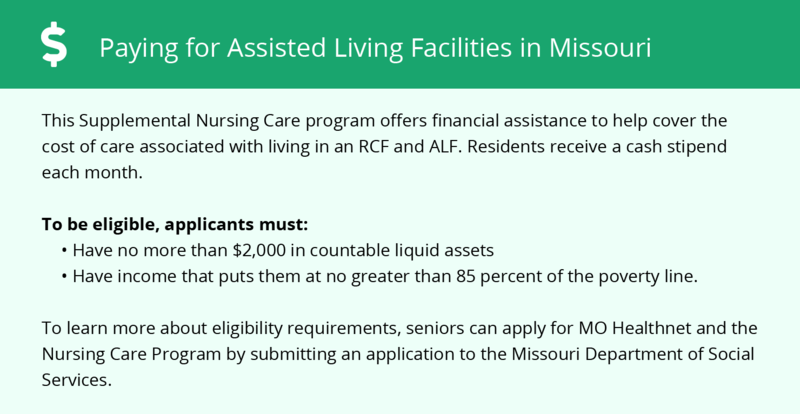 Assisted Living Facilities (ALFs) in Missouri are defined by the state as those premises which provide 24-hour care and services and help with Activities of Daily Living (ADL). These facilities are governed by the Missouri Department of Health & Senior Services. Licensing requirements and policies can be viewed in detail on the DHSS website. Independence is home to five assisted living facilities, with another 31 in the nearby area. The violent crime in Independence is 36.3 out of 100 (1 being the lowest), which is a little higher than the national average. Property crime is quite high at 70.4 compared to the national average at 38.1. Seniors may want to take extra precautions to secure their belongings. Independence receives around 14 inches of snowfall a year, which can make it difficult for seniors with limited mobility to be active all year round. Independence enjoys warm summers averaging 89 degrees in July, and chilly winters with an average low of 21 degrees in January. Seniors living in Independence experience a cost of living that is 16.1 percent lower than the national average. This might help seniors on a budget afford a facility with a higher monthly cost. Seniors with a severe respiratory illness or bronchial condition may have some difficulties in Jackson County. The American Lung Association gave this county a Particle Pollution 24-hour score of C. While this is a fair score, it may bother some seniors who are particularly sensitive. The city of Independence offers lots of activities for individuals who love history. Seniors can follow in the footsteps of former president Harry Truman and visit his favorite soda fountain. Seniors might also enjoy learning about pioneer history and the Oregon Trail or exploring the city's many museums and historic sites. The Independence area is home to world-class medical facilities, including Centerpoint Medical Center, in the event of medical emergencies or illness. Assisted Living costs in Independence start around $0 per month on average, while the nationwide average cost of assisted living is $4,000 per month, according to the latest figures from Genworth’s Cost of Care Survey. It’s important to note that assisted living rates in Independence and the surrounding suburbs can vary widely based on factors such as location, the level of care needed, apartment size and the types of amenities offered at each community. 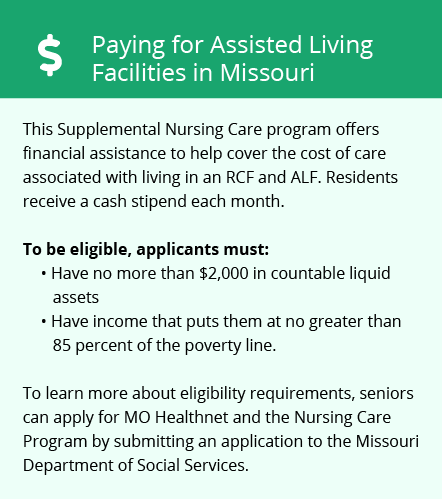 Missouri’s Medicaid plan offers assisted living coverage for eligible seniors. Non-Medicaid programs are available in Missouri. Seniors can take advantage of Missouri’s Pharmacy Assistance program, MORx, and the Older Americans Act. Independence and the surrounding area are home to numerous government agencies and non-profit organizations offering help for seniors searching for or currently residing in an assisted living community. These organizations can also provide assistance in a number of other eldercare services such as geriatric care management, elder law advice, estate planning, finding home care and health and wellness programs. To see a list of free assisted living resources in Independence, please visit our Assisted Living in Missouri page. Independence-area assisted living communities must adhere to the comprehensive set of state laws and regulations that all assisted living communities in Missouri are required to follow. Visit our Assisted Living in Missouri page for more information about these laws.